Welcome as we go 2 for 2 for the first time this season. Here is everything you need to know about this coming weeks pitching matchups and our 2 choices for pitchers that have two favorable starts on the schedule. These are the pitchers that you may consider adding to your weekly roster or ones that you may want to pick up and stream a start. If you are new to this game or unfamiliar with the strategy of streaming starting pitchers, click here for a refresher and some great links you can use. In this article you will find the FANFOOD Top 10 Pitchers with two starts, followed by a list of all of them. The FANFOOD 2 for 2 Starting Pitchers will be not be chosen from the “MUST STARTS”, those pitchers will always be in your lineup. They are the Starting Pitchers outside the TOP 10 that you probably have on your bench or ones that you could find on the waiver wire. They are guys that we feel will give you two quality starts. [ +/- 6 IP, +/- 3 ER ]. Also included in this article are some SP notes to help you decided on next weeks roster, followed by one streaming starter for each day of the week that the stat geeks over at the Muthaship think will be a viable option for your fantasy roster in the coming days. And if all this wasn’t enough, it’s followed by a great recipe. This time it’s Redneck Eggrolls. Cashner ended Cactus League play with a 2.30 ERA, 1.28 WHIP, and 9:1 K:BB in 15.2 innings. Other than getting rocked in his second-to-last spring contest — eight runs (four earned) in 3.2 innings on Mar. 20 — Cashner didn’t surrender a run on 10 hits and no walks, while striking out seven in 10 frames. The aforementioned shelling is an aberration, considering his breakout campaign from a season ago, but owners should be mindful of a 6.58 K/9 across 175 innings in 2013. Andrew Cashner held the Royals scoreless over three innings in his final Cactus League tuneup Tuesday. Cashner yielded two singles, didn’t walk anyone and struck out one. The big right-hander finishes the spring with a nice 2.30 ERA to go along with a 9/1 K/BB ratio across 15 2/3 innings. He’ll get the ball Opening Night on Sunday versus the Dodgers. Andrew Cashner allowed one unearned run on two hits in three innings while striking out one in Tuesday’s start against the Cubs. Cashner bounced back after giving up his first four earned runs of the season in his last outing. He owns a 2.30 ERA and 9:1 K:BB ratio in 15 2/3 innings heading into his opening-day start. Justin Masterson allowed just one earned run on three hits and two walks in 5 2/3 innings while striking out five in his team’s 10-3 win over the Brewers Wednesday. Masterson caps off an impressive spring with another strong performance, and he finishes the exhibition season with a 1.09 ERA and 25:6 K:BB ratio in 24 2/3 innings. Considering the team wasn’t able to come to terms with Masterson on an extension this spring, he’s primed to enjoy a big payday on the free market if he can turn in a quality season. Justin Masterson pitched well in his start against the Brewers on Wednesday, allowing one run in 5 2/3 innings. Masterson allowed only three hits and walked two while striking out five. The right-hander has had a fantastic spring, carrying a 1.09 ERA with 25 strikeouts and six walks in 24 2/3 innings overall. Masterson will oppose Sonny Gray of the Athletics on Opening Day. The Baltimore Orioles plan to start Miguel Gonzalez and Bud Norris in two of their three weekend games in Detroit, but had not officially announced which games they’d start. The Seattle Mariners hadn’t officially named their Nos. 3-5 starters, but James Paxton and Roenis Elias were the leading candidates for the first two spots in that order, while Blake Beavan or Hector Noesi might take the open Friday start. The Atlanta Braves haven’t yet decided upon their fourth starter, with either David Hale or Gus Schlosser assuming that spot on Friday. With Jake Arrieta (shoulder) out for Week 1, the Chicago Cubs will decide between Chris Rusin or Carlos Villanueva for a start either Saturday or Sunday. Mat Latos (knee) will miss Week 1, forcing the Cincinnati Reds to give a start to Alfredo Simon on April 6, the first time they’ll need a fifth starter. The Colorado Rockies have not yet decided between Franklin Morales or Jordan Lyles as their fifth starter, with Morales the leading candidate to assume that Friday slot. The injury to Clayton Kershaw thrusts the Los Angeles Dodgers’ rotation into question; Zack Greinke, who starts Tuesday, is the only one locked in. Hyun-Jin Ryu (toenail) is tentatively set for Sunday, March 30, but Dan Haren would move up if needed. Kershaw might be ready to pitch by Thursday. The Miami Marlins haven’t officially announced the winner of their fifth-starter battle, but Tom Koehler is likely to earn it — and a resulting Friday start — over Brad Hand. Jonathon Niese (elbow) is tentatively set to make his first start for the New York Mets on Sunday, leaving Daisuke Matsuzaka and Jenrry Mejia to battle for the remaining Friday vacancy. The loser of that competition would presumably take Niese’s place in the event of a setback. Though the San Diego Padres recently named Robbie Erlin their fifth starter, he won’t be needed until April 8 (Week 2) due to a Thursday off day. The San Francisco Giants could swap Tim Hudson’s and Tim Lincecum’s turns in the rotation, in order to set one up for the April 8 home opener (Week 2). Doug Fister’s (lat) injury makes him doubtful to pitch in Week 1, leaving Friday’s and Sunday’s spots vacant for fifth-starter combatants Tanner Roark and Taylor Jordan. Expect them to occupy those spots in some order. 1. Hector Santiago (SEA, Wednesday): The 2013 Seattle Mariners had the majors’ worst wOBA versus lefties, and their 2014 lineup remains chock full of lefties, like Robinson Cano, Kyle Seager, Brad Miller, Logan Morrison. 2. Corey Kluber (@OAK, Tuesday): Still a Kings of Command favorite of mine, and he kept up that good work this spring, with 23 K’s compared to three walks. 3. Mike Leake (@NYM, Friday): He is 2-for-2 in his career in quality starts at New York’s Citi Field, with a 0.69 ERA and 1.18 WHIP in those games combined. 4. Jorge De La Rosa (@MIA, Monday): Opening Day is never rich in quality streaming options, but De La Rosa at pitching-friendly Marlins Park stands out. 5. Tyler Skaggs (@HOU, Saturday): Strikeout potential — he K’ed 23 percent of the batters he faced at all levels in 2013 — and he’s facing 2013′s most whiff-prone team. 6. Nate Eovaldi (SD, Sunday): Home games are always preferable to road with Miami Marlins, and Eovaldi has a 0.79 ERA in two career games against the San Diego Padres. 7. Jose Quintana (MIN, Thursday): Recall that nine-inning spring nightmare of his if you wish; I like the fact that he rebounded in his next turn with five shutout innings. It bodes well for him facing this favorable opening-week matchup, at least. 2 thin slices of red onion, minced. 2 Tbsp of soy sauce. 1 Tbsp of white vinegar. 1 healthy pinch of brown sugar. 1-2 healthy dashes of sesame oil. 2- packages of Spring Roll Wrappers (Wei Chuan Brand), 25 sheets in a package, thaw completely and leave sealed package out, bring to room temperature. Always buy a few packages extra, keep frozen until needed. Smoke it at 250 with 1 piece of hickory and 4-5 pieces of peach…take off of the smoker at 205. or until tender and very easy to pull. Make filling and dressing and mix it all up with the pork. Combine egg whites and cornstarch in a small bowl. Mix well until corn starch is well incorporated with egg white. This is your glue for egg roll wrappers! Open the wrapper package and separate the sheets. Separate only 2-3 sheets ahead or they will dry out too quickly and it will be harder to roll. Here are the steps to rolling egg rolls. 1. The key is to not to put too much filling, 1 tablespoon is good amount. 2. First fold should be snug against the filling, shaping into a cylinder shape, not a flat parcel. 3. Fold over both sides of edges, make sure the folded lines are parallel, which will result in a neater roll. 4. 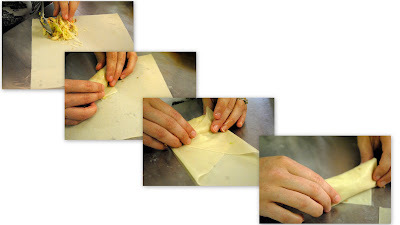 Using your finger, smear egg white/cornstarch mix on the top triangular edges and finish rolling. There should be a complete seal.